A few months into his presidency, Ronald Reagan issued a “Statement on United States Immigration and Refugee Policy” in which he outlined his goals to continue America’s tradition of welcoming people from other countries, especially those fleeing oppression. He called for the millions of undocumented “illegal immigrants” present in the country to be given recognition and a path to legal status — without encouraging further illegal immigration. On Nov. 6, 1986 Ronald Reagan signed the Immigration Reform and Control Act of 1986, the most far-reaching immigration law passed during his presidency. The Act’s most significant effect was that it allowed immigrants who had entered the U.S. illegally before Jan. 1, 1982 to apply for legal status, provided they paid fines and back taxes. 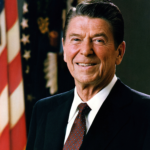 This provision — which Reagan himself referred to as “amnesty,” allowed around 3 million immigrants to secure legal status after paying $185, demonstrating “good moral character” and learning to speak English. Although the bill was supposed to toughen sanctions against employers who hired undocumented immigrants, a provision exempting employers from penalties if their workers had presented relatively convincing fake documents meant that the sanctions were ineffective. Between 1980 and 1990 — a span that included the eight-year Reagan administration— the foreign-born population of the U.S. increased from 14.1 million to 19.8 million. This change included 4 million more Latin American-born residents and 2.4 million more Asian-born residents — and nearly 800,000 fewer European-born residents.